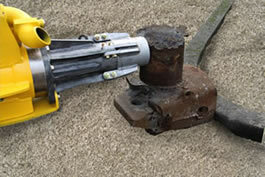 PowerHammer machines are pneumatically operated single blow impact hammers designed and intended specifically for ferrous foundries to knock off risers, feeders, gates, runners, sprue, etc during the cleaning process. PowerHammers are manufactured in seven model sizes and can modernize your steel or iron foundry by replacing everything from a hand held small sledge hammer to abrasive or gas flame cutting devices to a massive swinging demolition ball. Please look over the various sections of our website and then contact us to help you find the PowerHammer Model that is “just right” for your plant.